Looking for a Creamy Rice Pudding recipe? This is my absolutely favourite rice pudding, that is, in my opinion, the creamiest and most delicious rice pudding you can make! I have been making this rice pudding forever. I love rice pudding. I know some people tend to think of it as quite humble food, but when done right, it’s about as far from humble food as you can get. 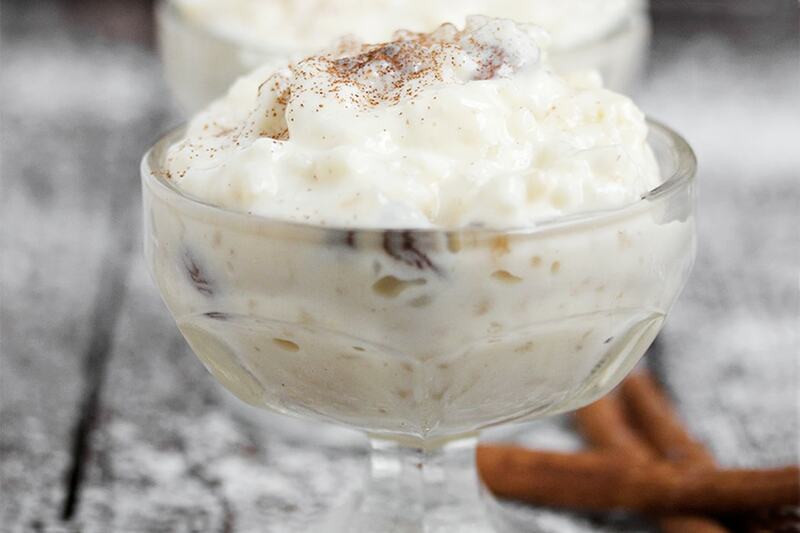 This rice pudding is classic, it’s creamy and it’s definitely done right – with Arborio rice, whole milk, egg yolks, sugar, vanilla and heavy cream. It’s a treat! Over the years, I have made this pudding with all kinds of rice and with different combinations of milk and cream, depending on what’s on hand. The recipe below is the perfect combination of ingredients, in my opinion, but do refer to the Cook’s Notes below the recipe for more information on substitutions and how they work. And since I’ve made this pudding so many times and discovered every possible place this recipe can go wrong, I’ve included lots of detail in the actual recipe instructions, as well as outlined them in the Cook’s Notes. You can use long-grain rice in place of the Arborio rice. I love Arborio, a medium-grain rice, because it is plump, doesn’t get mushy and introduces just the right amount of starch to the pudding. Note that long-grain rice will take longer to cook. I wouldn’t recommend a short-grain or short-cooking type of rice for this pudding. There is no need to plump your raisins ahead (soak in hot water to plump them up). The hot pudding mixture will take care of that for you. 1) Not watching the pot as your milk comes to a boil at the start of cooking and having it boil up and all over your stove. Use a large pot and watch very closely as it nears the boil (starts steaming), to avoid that mess. 2) Simmering the milk/rice mixture too vigorously and/or not stirring it down regularly. Either can result in rice scorching on the bottom of the pan or the mixture drying out before the rice has a chance to cook. Keep mixture at a gentle, just-barely simmer and stir it down regularly. I like to set the timer on my stove in 10/5-minute increments, to remind me. 3) Adding too much hot liquid to your egg mixture too quickly. You need to bring the temperature of the egg mixture up very slowly (called “tempering”), so that the eggs don’t cook/curdle. Add a drop at a time (really!) at first and whisk continuously while adding. You can increase to a slow stream as you go along, but keep whisking and don’t rush it. 4) Not cooking the pudding long enough after you add the egg mixture, resulting in a soupy finished pudding. It can be hard to tell the first time you make it, when your custard has cooked long enough. It helps to know what you’re aiming for. It won’t look like the finished pudding in the photos. It will get there once it’s refrigerated and set, but off the stove, it should look much more saucy. BUT, the sauce part should be creamy and noticeably thickened – not thin like milk. My method is when the pudding nears the boil (lots of steam rising from the mixture), I will stop stirring for a 10-15 seconds, to see if any bubbles rise in the middle. If not, I keep cooking, stirring for another minute or so, then I stop again, to see if any bubbles rise. Once I see a bubble rise, I keep cooking, stirring, for only about 30-60 seconds more, then remove and pour into serving bowl. If despite it all, your pudding has been in the fridge for 6-8 hours and it didn’t set (it’s soupy), you can pour it back into the saucepan and cook it up to boiling again, to thicken it. Then refrigerate again. The rice may get a bit softer from cooking twice, but it will still be tasty. A delicious and creamy rice pudding recipe, cooked on the stove-top, using Arborio rice. Be sure to watch closely and stir as required. Refrigerate after cooking for at least 6 hours, so it will set as it cools. Rinse a large saucepan with cold water. Don't dry. Set on stove-top over medium heat. Add milk. Heat milk to boiling, over medium heat, stirring regularly. WATCH CLOSELY as it nears the boil! When milk hits the boil, it will boil up and possibly over. That's not a good thing. Meanwhile, in a 2-cup measuring cup or similar sized bowl, use a fork to whisk together the cream, sugar, yolks, vanilla and salt. Set aside on counter while rice is cooking, leaving fork in bowl. Set out a ladle to use, as well. I like to do this after the rice starts cooking, so that the mixture comes to room temperature by the time it's needed. Once milk/rice has simmered for 30 minutes, continue simmering, but stir down every 5 minutes. With each stir, start testing the done-ness of the rice by tasting a piece. You want the rice to be tender (so no hard center). Arborio rice is generally done in the 35-45 minutes of total simmering time. Long-grain rice could take up to 60 minutes. A lot will depend on how vigorously your mixture is boiling, so there is no hard and fast rule. Taste testing is the best indicator. Once rice is cooked, slide saucepan off the heat. Re-whisk your egg mixture with your fork. Using the ladle, spoon out a ladle-full of hot rice/milk mixture, taking as much liquid as possible, but not to worry if you bring some of the rice with it. 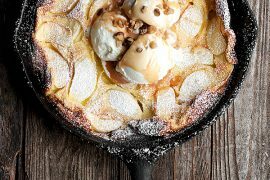 With the ladle in your left hand (assuming your right-handed, if not, reversand using your right hand to start whisking the egg mixture with the fork, start adding the hot mixture to the eggs A DROP AT A TIME, at first, while continuously whisking with the fork. Increase to a slow stream, while whisking continuously, until the entire ladle-full has been added. Get another ladle-full of hot liquid and slowly add it to the egg mixture as well, whisking continuously. Keep adding hot liquid until you've got at least 1 1/2 cups-1 3/4 cups of now warmed liquid in your 2 cup measure. Once you have reached that point, pour the warmed egg liquid into your rice/milk mixture. Return saucepan to heat, over medium-low heat. Cook, stirring almost continuously, just until a dime-sized bubble breaks the surface of the pudding. Pudding should be noticeably thickened and saucy, but still more sauce than rice (pudding will set more in the fridge as it cools). If liquid seems almost like milk consistency (rather than heavy cream consistency), it's too thin. Cook, stirring, a little longer. Note though that you don't want to vigorously boil the mixture after the egg mixture has been added, as you may end up with scrambled eggs. If using raisins, add to the bottom of a medium-large bowl. When pudding is cooked, pour hot mixture over raisins. Stir well to combine. Allow to stand on counter for about 5 minutes, to allow the steam to reduce, then cover bowl with plastic wrap and place into the refrigerator. Allow to cool and set, at least 6 hours or preferably, over-night. Pudding will set as it cools. To serve, simply stir and spoon into bowls. Serve with a sprinkling of cinnamon, if desired. If pudding is or becomes too thick, simply add a tablespoon or so of heavy cream to mixture and stir in. Bomb.COM!! Damn this was delicious. Was disappointed to see that it didn’t make that much in the end. Lol will definitely double the recipe for next time. Thank you!! Spectacular!!!!!!!!!! Would not change a thing! I made this with Jasmin rice added 2 tbs.butter and it was fantastic. Thank you for the tips for success. Love, love love this creamy rice pudding it is a keeper!!! This is seriously the best, so creamy and so flavorful. I’ve made it in double batches and it’s a major hit! Thank you! I made this rice pudding as part of a feel-good, comfort food meal I was making for a friend, post surgery. I followed the recipe to a T (but did add dried apricots w/the raisins). It came out sooo delicious! She thought it was a recipe from my grandmother 😉 I am lactose intolerant and wondered if this can be made with soy or almond milk? Thanks for a yummy dessert! So glad to hear, Donna! It is the only rice pudding I have made for years as it’s my idea of perfect rice pudding. Thanks! OMG! So good! This is now my go-to recipe for Rice Pudding! I followed instructions to a T and it turned out amazing! My husband is so picky when it comes to rice pudding and he tried it and looked at me and said “holy sh*t you nailed it!. The rice pudding recipe I grew up with uses stiff beaten egg whites folded in after it has cooled to lighten it. Have you done this with this recipe? Will this recipe be successful if I double it. Not all recipes can be doubled. Thanks for a great treat. I doubled it for Thanksgiving this year and it was delicious. Even the pickiest “rice pudding connoisseur” couldn’t stop eating it. So glad to hear, Mariek :) Thanks! This recipe rivals the most incredible rice pudding from a now closed Greek restaurant. Used Arborio rice; looks intimidating but is easy to make. Now a star in our family recipe collection. Will certainly return to your website often. Your recipe is the One!!!!!! After many years of searching to find a recipe that tasted like my mum use to make. Quick substitute question, I want to make this for work mates but have limited pantry so can I substitute aborio with jasmine and more milk instead of cream? Hi Cathy, I find jasmine quite a soft rice, so I fear it might turn out a bit mushy. As for the milk instead of cream, it is going to affect the thickness and creaminess of the finished pudding. So on both counts, I think you might not be as pleased with the outcome. 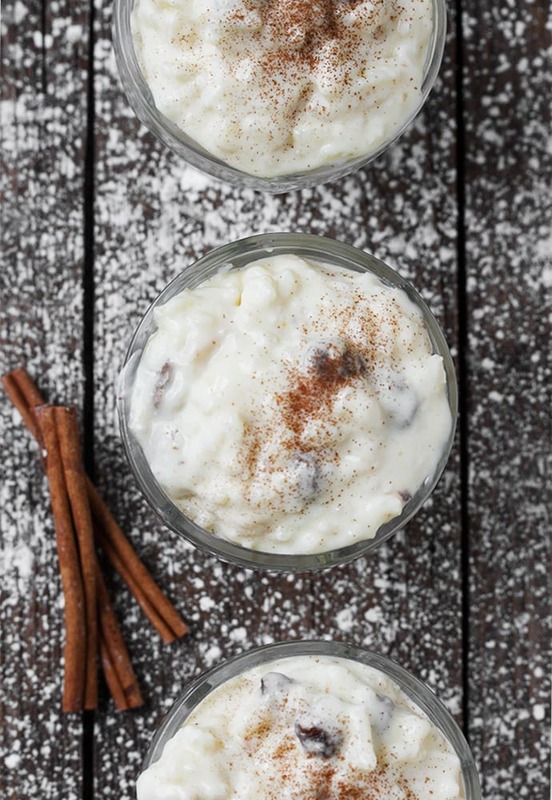 I just have to give u a big thanks for posting this recipe, I’ve been having rice pudding ever since I was little and once I could make it for myself I started to adjust the recipe to what I like …. always feeling alittle disappointed after every attempt…. until now that is this one is amazing !!! I use brown sugar instead but this one is by fast the best recipe I have come across !! I enjoy that is heats well and still tastes amazing the next day. So glad to hear, Jaime :) Thanks! Made this rice pudding today. It is the best. 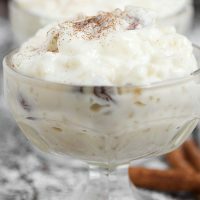 My best friend’s mother used to make the best rice pudding and I have been looking for a recipe that was close to hers, for years. I think I hit pay dirt. My only twist is to soak my raisins in brandy. So glad I found this. when do add the 35% heavy cream? the directions do not includes…is it added with the 4 cups of milk at the beginning? Hi La-Verne, no, the cream goes in at the end. It’s listed in Step 3 of the instructions. Thanks for the incredible recipe with such thorough directions! I made this for a Scandinavian Christmas baby shower, then later for New Year’s and it was a hit both times! So glad you enjoyed this, Beth. It’s a recipe I have made for many years. One of my favourites :) Thanks! I made this today for my father. He is very ill and not feeling like eating much. But he needs to eat more or he will end up in hospital. I know he loves rice pudding but not something we ever think to make nowadays. So I thought this might be nice for him. I brought it over this afternoon and he ate a small bowl of it. It is delicious and was a hit! Great instructions. It turned out perfectly the first time I made it. Thanks! That is so wonderful! I am so glad :). Thanks! Delicious recipe! I have always had trouble with my pudding thickening, but this recipe produced perfect consistency. I used organic coconut milk instead of cream, and it turned out delicious. Thanks for this recipe! Thanks Andrea and so glad you enjoyed it! Tastes like my childhood! Used whole milk for the whole thing and 2 whole eggs rather than just the yolk and it was still amazing! Thank you! So glad to hear! It reminds me of my childhood, too. Great comfort food :) Thanks! Hi Reg, I don’t believe it would freeze well, but honestly, I’ve never tried it. As it is custard based, the texture is most likely to change when frozen. The easiest, yummiest rice pudding ever! I added almond extract, for extra flavor and it was a hit! So glad to hear, Rebecca :) It is one of my favourite treats! Creamy….so tasty….I added a bit of cinnamon and whipped cream….and ate half the batch! First time trying this recipe and IT TURNED OUT PERFECT! Gotta eat the other half now….Mmmmm SO GOOD! So glad to hear, Gerry! I have a habit of eating half the batch right away, too ;) Thanks for coming back to let me know. Yum! 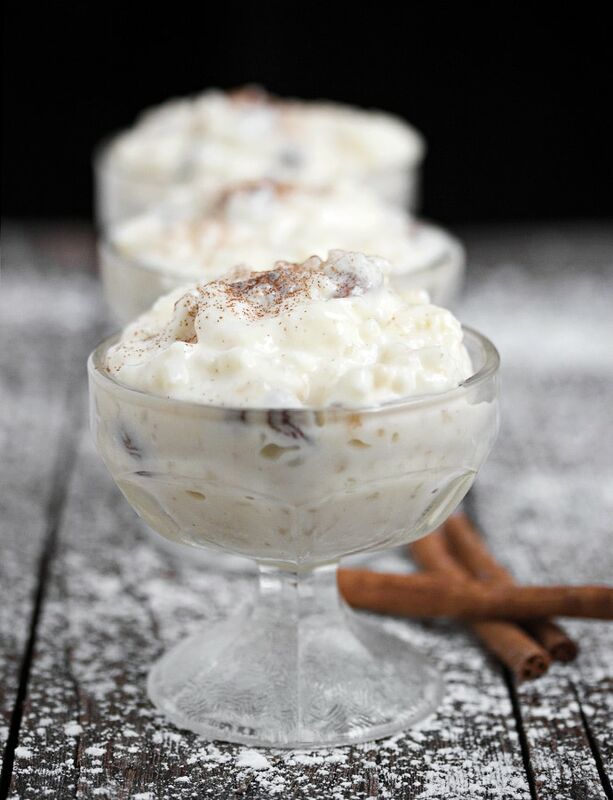 I LOVE rice pudding, it’s my fave dessert & your recipe’s very close to mine. I use a combo of milk & half & half, or milk & heavy cream like you do. I always add a little almond extract, a vanilla bean, plus some vanilla extract too, for a very vanilla and slightly almondey flavor! I usually always whip up a batch of homemade whipped cream to top it with too, along with cinnamon of course. Mmmmmm. And I am with you. I eat this all times of day and it somehow always manages to be perfect for the moment. Here in Spain “Arroz con leche” (milk rice) is one of the most typical deserts around and you will find it on almost every menu. They cook the rice (here we use Bomba rice – the Spanish variant of Arborio) in full milk together with a cinnamon stick and the peel of half an orange (the Spanish cook all their deserts with cinammon and citrus fruit! It´s their Moorish roots!) They do not use eggs but add butter to the milk which makes it really creamy. Must be served right out of the fridge! Saludos from sunny Andalucía!! I haven’t had rice pudding since my sweet mother in law passed away. I think I’ll make your recipe and surprise my husband…I know he will be thrilled. My dad was pretty obsessed with rice pudding, so I know he would have loved yours, Jennifer! Wish he was still around for me to make it for him, so I guess I will have to make and devour this in memory of him. Your rice pudding looks perfectly creamy and dreamy, my friend! Two thumbs very high up! Cheers – to a beautiful weekend! I think it would be wonderful to eat some in memory of your Dad :) Have a wonderful weekend, too Cheyanne! I’ve been searching for a rice pudding recipe for ages!! This looks absolutely perfect. And that dark grey wood is the perfect backdrop! 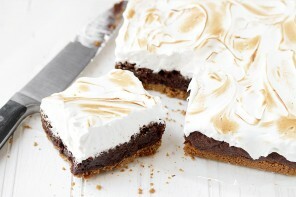 This looks so creamy, what a scrumptious treat! This looks delicious! My husband thinks the idea of rice pudding is weird, but I think it is so good. My grandmother used to make a delicious rice pudding and I don’t think I’ve had it since I was a kid. Now I’m going to be dreaming about this creamy deliciousness until I can have a big spoonful. Thanks for a great recipe, Jennifer! Thanks Robyn. My Mom only made it once in a while. I discovered it at a local diner type restaurant when I was in my teens and I’ve loved it ever since!! I made rice pudding for the first time the other day. It was amazing and I cannot wait to try more recipes like this one. This is my dream dessert — i love how creamy arborio rice gets — thanks for the detailed instructions, I’m excited to make this! Rice pudding reminds me of my Dad Jennifer. He used to love it. I’ve never even tried it, but yours looks so delish, I think I’ve been missing something. Love the raisin addition! Good rice pudding is one of my favourite things! Your recipe sounds perfect!